Trees that would normally die are salvaged in a commercial thinning. A commercial thinning (CT) results in direct immediate economic benefit, increased future value, and improved health and vigour of the forest stand. It is beneficial when the forest has reached a point where too many trees are competing for nutrients and light. Growth rates are slow as individual trees are out-competed. When nature is left to thin the stand, it results in volume losses, produces poorer quality wood products and slows tree growth. The main difference between a CT and a pre-commercial thinning (PCT) is the size of the trees. When doing a commercial thinning the final harvest will not have increased volumes, but trees that would die if untended will be harvested and sold. CTs involve cutting trees that have reached diameters that can be processed and sold. This brings immediate revenue, in addition to improving future economic value of the stand. CTs, along with PCTs, receive positive reviews from other nations. This may be an important factor when Sustainable Forest Certification becomes a standard in global marketing of wood products. As with a PCT, diameter growth will be directed on fewer trees. This will decrease final harvest costs by reducing the total number of trees for a given volume of wood. Removal of defected and damaged trees will increase the quality of the remaining trees at harvest. Clear, straight boles can be selected to leave, which will increase product value and reduce harvest costs. Unlike PCTs, trees left after a CT are less likely to produce a change in specific gravity. Fibre length and the amount of compression wood may change, but not significantly. Stand composition can be improved. Undesirable harvest species can be removed during the CT. This leaves higher value crop trees for the final harvest. Stand diversity can be improved. A CT is an excellent opportunity to improve general aesthetics, wildlife habitat or diversity of tree species. A CT can improve trees and stands to resist insect and disease damage and mechanical damage from snow and ice. Vigorous growth is encouraged by development of stronger crowns and root systems. Crowded stands with a mix good and poor trees will benefit from a commercial thinning. A CT is generally done as trees are moving from a juvenile to a mature stage of growth. Both hardwoods and softwoods will benefit from a CT. It will have a positive effect on the growth rates of most commercial species and is well suited for Nova Scotian forests. Softwood CTs should have a land capability (LC) of at least LC4. Hardwood CTs should have a LC of at least 2. Site classes lower than this will not respond to thinning quick enough to make it worthwhile. In some cases, the response on poor sites can be so slow that better adapted, non-commercial species can invade or spread over the site and defeat the purpose of the CT.
At the time of thinning the average merchantable diameter should generally be 14 cm (6 inches). This is the average, so smaller merchantable diameters will be included in the overall harvest. Crop, or leave trees, should have a live crown that covers at least one third of the total height of the tree. Trees with less crown are susceptible to damage after thinning. These trees will frequently break if snow or ice builds up on the crown. When you thin a softwood stand that has been accustomed to growing close together, they must be wind firm. Before thinning, trees hold each other up due to their tighter spacing. When the wind blows, one tree is supported by the next, and so on and so on. Once thinned, trees must stand more independently from the next tree. Ability to resist wind throw is dependent on tree species, soil characteristics and exposure. Pines and hardwood species are more wind firm than spruces or balsam fir. Trees growing on sandy or gravel soil types are generally more wind firm than those on thin or clay soils. If you don't know, seek the assistance of a forest professional. It is possible to thin less stable stands, but it involves very light thinning and multiple re-entries. Diameter growth of the stand to be thinned should be just beginning to show signs of slowing down. This indicates the trees are crowding each other and require more space. If wide growth rings are still obvious, then it may be too early to thin. Trees should be healthy and vigorous. Stands that have suffered attack from insects or diseases should be avoided. Good, general health of the stand for the next 20 years should be anticipated. Suitable softwood species include red spruce, red pine, white pine, hemlock, black spruce, Norway spruce, balsam fir and white spruce. Black spruce should be less than 50 years of age. Balsam fir and white spruce should be less than 40. The only softwood species not suitable is eastern larch. Hardwoods suitable for a CT include yellow birch, red oak, sugar maple, and white ash. Red maple, white birch, beech and all poplars are not recommended for this type of thinning. There are advantages to removing fewer trees at each harvest if it is economical to do so. Many contractors cannot afford to return to the same stand to remove a small volume of wood several times. This results in increasing the cords per acre (or m3/ha) removed during an individual CT. However, this option may be okay for a landowner operating his own woodlot. Re-entries may also be affected by the type of product harvested. Low value products, such as pulpwood, are less likely to justify multiple re-entries than veneer logs or high value hardwoods. In these cases, harvest value of the end-product can compensate for multiple re-entries. For small woodlot owners, the cost of multiple re-entries may be outweighed by aesthetic benefits and reduced risk of blowdown. Removing small quantities of wood during each thinning may go unnoticed. This can be important if the woodlot is used for recreational purposes. Although multiple re-entry is more expensive overall, it can produce a larger total harvest because it avoids the losses associated with wind throw and remove trees that succumb to disease and insect damage. Increased costs may be less important to the small private owner of a multiple-use forest. Multiple re-entries can reduce the effect of wind in sensitive areas. Properly conducted, low-intensity CTs will increase wind firmness of leave trees. Root growth will be stimulated in leave trees because of more space, sunlight and nutrients. Greater movement of trees in the wind will encourage development of more roots which increases stability. Wildlife is often less affected with multiple re-entries. Although disturbance is more frequent, intensity is less. Re-entries can also be used to gradually create a better age structure in a stand. Regeneration can be encouraged in the small holes created by the thinning. Although hardwoods are more wind firm than most conifers, the canopy should not be opened too much. Increased light conditions in the understory can encourage epicormic branching. These branches take energy from the tree and can reduce diameter growth. They also reduce the value of clear saw log boles. Another disadvantage of high light conditions is an increase in sprouting. Sprouts can easily out-compete more valuable trees grown from seed. It can also be less aesthetically pleasing to crowd the understory with too much re-growth. Hardwoods have a deeper rooting depth, which improves stability on exposed sites. They also drop their leaves during the fall, reducing their resistance to the wind and making them wind firm. Choosing proper crop trees is also more critical with hardwoods. They are slower growing and care must be taken to ensure that healthy, vigorous trees are selected to leave. Identification of hardwood species is sometimes more difficult, especially in winter. Basal area is the area in square metres (or square feet) of the cross section of the tree trunk at breast height. It is most commonly used as an indicator of stand density and is expressed as square metres per hectare (square feet per acre). In a PCT, tree spacing was used to determine which trees to remove and which trees to leave. Because of the number of stems and the small diameters, it is the most practical way to plan and conduct a PCT. In a CT, proper spacing is more difficult to determine than proper basal area (BA). The trees are larger, therefore the spacing is too wide to easily estimate when doing the thinning. The variation in diameters must also be taken into account. Large diameter trees have larger root systems and crowns. They must be given more space than a small diameter tree. Larger trees also have more harvestable wood. One 35 cm (14 inch) diameter tree has more merchantable wood than three 20 cm (8 inch) diameter trees. The BA method will account for the space required for both large and small diameter trees in the same stand. Basal area is measured by adding the area of the stems of all trees in the stand. Because of the time required to measure every tree, only a sample of the stand is measured. The sample is used to predict the total amount of wood in the stand. Once this has been determined, the thinning can be planned using basal area removal. This is the method used most by contractors and large forest industrial landholders. The most common methods of sampling a stand to determine the basal area is by using a prism or relascope. These methods quickly provide an estimate of basal area, but neither one is exact. They can only serve as a guide. Trees are counted if the displaced stem overlaps with the main stem. Go to a spot in a stand and do a complete circle, counting only those trees that are not totally displaced (see illustration below). With a prism you need to use the prism as the centre of the plot and rotate around it. For a 2 factor prism, multiply the number of trees by 2 to get the basal area for the stand in square metres per hectare (eg. If you count 20 trees, your basal area is 40 square metres per hectare). 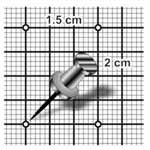 Use a pin to prick corners on a stiff piece of cardboard or plastic as marked on the graph paper. The opening must be exactly 1.5 cm wide. A 1 mm error in notch width will affect accuracy by approximately 10 per cent. Cut the outer edges as drawn (dimensions are not critical). Attach a string below the opening as shown. Knot the string exactly at 53 cm from the relascope. A 1 cm error in string length will result in a 10 per cent error in accuracy. With a 2 factor relascope (eg. BAF = 2) each tree that completely fills the opening will represent 2 square metres of basal area per hectare (The way it works is this: BAF = a2/y2 x 2500 where a = notch width and y = length of string). To use the relascope, go to a spot in a stand and do a complete circle using your eye as the centre of the circle. As you make the circle, hold the knot of the string to your face and pull the other end tight horizontally away from you. Count only those trees that completely fill the opening in the relescope. Multiply this number by 2 to get the basal area for the stand in square metres per hectare (eg. If you count 20 trees, your basal area is 40 square metres per hectare). When using a relascope, remember to use your eye as the center of the circle. You can also predict when your stand should be thinned again using the catch-up rule of thumb. On an average site, divide the percentage basal area removed by 2. This will tell you how many years will pass before another thinning is required. Exercise 6: Make your own relascope with 2 feet of string and a stiff piece of cardboard or plastic. Cut a notch 1.5 cm wide and tie a string or chain 53 cm. This will give you a 2 factor relascope. If you decide to remove 40 per cent of the basal area during a commercial thinning then (40 / 2 = 20) it will be 20 years before the stand will require harvesting or another thinning. CTs may be done any time of year, but certain times have advantages. Spring is generally a poor time. Trees are active moving sap to new leaves and shoots. Crop or leave trees will be susceptible to damage by both machinery and falling trees. Avoid CTs on exposed sites in the fall. In fall wind can cause most of the blow downs. The roots of remaining crop trees, even if slightly injured by CT machinery, will be more susceptible to disconnection from the ground. Winter and summer are the best times for CTs. The only exception to this is on sites susceptible to wind damage. These sites can be wind firm through the winter months once the ground is frozen. If winter snow arrives before the ground freezes the root mat, trees can be susceptible to wind damage. Winds during winter storms are some of the strongest of the year. Wet snow and ice can make wind resistance greater, creating problems that are more serious in high winds. Care must be taken when using heavy equipment during a thinning. If the roots of the leave trees, especially those close to the stem, are damaged by heavy tires they will be more susceptible to wind throw. Leave behind trees valuable for wildlife and biodiversity. These include trees with cavities or twig nests, and species not commonly found. Trees that were selected during previous treatments should be included again. It is recommended to leave behind a minimum of five wildlife trees per hectare. Long-lived, wind firm species are preferable. Most types of extraction equipment can be used for a CT. When selecting a method and equipment, consider the type of product, trail patterns, equipment size, time of year, topography, soil type and equipment availability. Available equipment, such as your own tractor, often determines what type of equipment will be used. This is OK as long as the job is properly planned. See the table on page 29 for more specific information on selecting equipment for thinning. Avoid using heavy equipment on wet or fine textured soils such as clay, unless the soil is dry or frozen. Uneven terrain can cause some problems with unstable types of equipment, such as small tractors and ATVs. These and other factors will determine what method and piece of equipment is best suited to your CT. If in doubt, ask a fellow woodlot owner or a forest professional. Determine what types of products you will be cutting and find a buyer. Wood buyers will have specifications on type of tree, diameter sizes and log lengths. The wood being removed will be smaller diameter than an average harvest operation. Total volumes removed will be less than a final harvest. Estimate the number of cords to be cut. You may have to cut your wood over a long period, one truck load this year and one the next. Contact a trucker and make sure your wood can be delivered on time. Don't wait until the wood is piled roadside. Leave coarse woody debris on the ground to improve wildlife habitat and biodiversity. It will eventually break down and provide nutrients for the remaining trees. Old agriculture fields that have been planted or naturally regenerated may need more left than a similar forest stand. These stands, unlike natural forests, start with an organic matter or debris deficiency. If the area to be thinned has more than one crop species, prioritize based on markets and objectives. If you plan a final harvest of poles, red pine should be favoured over white. The white pine can be removed now or maybe in the next thinning. Remember that markets change, so seek the help of local buyers for suggestions about the best product to grow for future markets. What you can sell now may also influence your decision on what to thin in mixed stands. In the absence of any market information, the following is a basic priority list beginning with the most preferred crop species: red spruce, white pine, sugar maple, yellow birch, white ash, red oak, eastern hemlock, red pine, white birch, red maple, balsam fir. This list is based on the value of the species, as well as its ability to respond to a CT.
To ensure the stand can regenerate, do not remove too many trees. You must cut or thin enough to make the treatment economically worthwhile but not too much. This is especially important on sites that may be susceptible to wind throw. Sites susceptible to wind damage are not just located on hilltops and bluffs. Sites where anchor roots are unable to penetrate the soil can be extremely susceptible to this type of damage. Shallow soils over bedrock and fine textured soils that remain wet most of the year can cause problems with wind throw. Most sites like this are easy to recognize. If you notice blow downs in your stand have a good look around and thin lightly. Pines and most hardwood trees are more wind firm. When thinning, spacing distances can be increased for pines. Even though hardwoods are more wind firm, greater spacing distances will create unwanted lower branching. CTs on plantations or previous PCT sites will be much less likely to have problems with wind-throw. As discussed earlier, the most complicated step in planning a CT is determining how many trees to remove and spacing of the crop trees. There is a lot of information to help you make a good decision. Average spacing for a softwood CT varies between 2 metres (7 ft) and 4 metres (13 ft). Exact spacing depends on species, size and basal area removal. An average spacing for hardwoods is 3.3 metres (11 ft). This will leave approximately 1,100 crop trees per hectare in soft wood stands, 900 crop trees per hectare in hard wood stands and 1,000 trees per hectare in mixedwood stands. The crown of trees in CTs must have space to grow. When thinning there should be a minimum of 1 metre (3-4 feet) between the crowns when viewed looking up. The space between crowns should be measured from branch tip to branch tip of adjacent trees. The branches used to determine this should be the widest on the tree. These will almost always be the lowest branches on the tree. Distances between crowns should be determined by tree species and site characteristics. A LC6 pine site might have 2 metres between crowns, while an LC6 hardwood site might only be 1 metre. The final step before starting the saw and beginning your CT is laying out the extraction trails and marking crop trees. Trails should be laid out in a herring bone fashion (see illustration). Mark the trails with flagging tape, making sure they are wide enough to account for the width of the extraction equipment. Try to connect the trails at the end, especially if you're using a trailer to extract wood. Keep trails as straight as possible, although broad sweeps can be made while avoiding crop trees. Where terrain is rough, trails should be slightly wider to account for leaning of extraction equipment. Curves will require some additional width as well. This is important when hauling tree length. Keep stumps in trails low to avoid damage to equipment. Distance between trails will be determined by the extraction system. Trails should be closer for short wood systems; 12 to 14 metres (40 – 45 ft) is average. For tree length products using winches, 24 to 36 metres (80 to 120 ft) is better. When harvesting tree length material, let trees fall toward the trails. Remove trees safely and efficiently without causing any damage to remaining crop trees. Be aware that damage to buttress roots can seriously affect the growth and health of crop trees. Leaving "brush mats" on the extraction trails will help reduce damage to these roots. A brush mat is a bunch of branches and tops left from cut trees. This material can be piled over large roots of leave trees. This will protect the roots from damage caused by extraction equipment. Brush mats can also be used to build short roadways over wet or boggy areas. Herring bone trails make wood extraction easier. Another method of protecting crop trees is using bumper trees. Trees that are marked for cutting can be selected to protect the stems of crop trees from damage caused by dragging of other trees to trails. Where trees to be removed will scrape valuable crop trees, leave a remove-tree to protect them until all the trees have been skidded out. After the trees have been moved to the trail, then cut the bumper tree. These trees can also be used to anchor cable pulleys. Mark the trail centerline. Make sure the cutting crew is clear on what has been marked. Mark crop trees to be left. It is important to make sure that anyone working on the CT understands what trees to leave. It is quite common to mark trails with one colour of flagging tape while marking leave trees with another. When selecting trees to remove, always choose damaged, poor quality or diseased trees first. It is better to select a healthy, second choice crop tree than to leave a damaged first choice tree. Even injuries like porcupine damage should justify tree removal if another good tree is nearby. Although this injury may heal over, it can still reduce the value of the bole significantly. Trees with excessive limbs should be removed before well-pruned trees. Dead branches that remain on the tree while the stem or bole is growing will leave knots in the wood. The longer these branches remain on the tree, the more knotty the finished product will be. If your buyer prefers clear lumber, you'll want to select these trees for early removal. Remove these trees in the first CT so you don't waste time adding volume to low grade trees. Always favour dominant and co-dominant trees over intermediate and suppressed trees. These trees are still growing rapidly and will respond better to release. The only time you would favour an intermediate or suppressed tree is in the case of injury, disease or poor quality individuals. Regardless of crown class, crop trees must have a good live crown ratio. The crown should make up at least one third the height of the tree. Avoid creating large openings, which reduce volume growth and can encourage excessive limbs on surrounding trees. Spacing should be tighter around the edges of the CT if the adjoining stands are less forested. If the site is bordered by roads, young plantations or agricultural fields reduce thinning intensity for 10 to 20 metres (30 to 60 ft). The forest edges not only take the brunt of the wind load during storms, they also maintain cooler temperatures and higher relative humidity during warm summer days. This effect can extend far into the forest. The edge is where wildlife diversity is greatest and is aesthetically important to many landowners. If the stand borders another forest type of equal or greater height, then thinning to the edge is not a problem. Maintaining the integrity of forest edges should be a priority. Make sure that the stand you want to CT has species that are recommended for this treatment. If there are trees not recommended for a CT, they can be removed. while the shortest trees are suppressed. Recognize the difference between crown classes. Crown classes show the dominance of the trees in the stand. Dominant trees are taller than average trees in the stand. Their crowns extend above the level of the canopy. They receive light on top and part of the side. They are in the most desirable position for crop trees. Co-dominant trees are those that make up the general level of the canopy. There are generally more co-dominant than dominant trees in a stand. They are also preferred crop trees, although dominant trees should be left first. Intermediate trees have crowns below the general level of the canopy. They receive little direct sunlight from the top and none from the sides. These trees can be released but they have already slowed down and will take longer to respond. They should be removed before dominant and co-dominant whenever possible. Suppressed trees have crowns that are entirely below the general level of the canopy. They receive little or no direct sunlight. These trees will most likely die before the final harvest. They are preferred for removal during CT.
General guidelines for choosing equipment for thinning. Actual results depend on how and when (season) equipment is used. Good results requires good planning. Straight trails are best when possible. Three thinning philosophies can affect selection of crop trees and future harvesting goals. It is useful to have an understanding of these when selecting crop trees in a CT.
Low thinning or thinning from below is one of the oldest methods. In low thinning, trees are removed from the lower crown classes, while most of the crop trees are dominant and co-dominant. This type of thinning is most suited to the natural evolution of a stand where the lower crown class trees die. It will make the best use of product that would be lost to mortality or reduce the growth of better trees. Thinning from below is the safest method of thinning where blow downs might be a problem. Removal of lower crown classes does not make openings that leave a stand more susceptible to wind throw. Make use of this thinning method when crop species or site exposure may create a wind throw hazard. When crown thinning, trees are removed from the middle and upper crown and diameter classes. With this method, some of the larger trees in the stand will be selected for cutting. Dominant and co-dominant individuals are still favoured for crop trees, but are left in a more open canopy position. In crown thinning the majority of the cutting is done in the upper crown classes, leaving more of the intermediate class. Crown thinning increases the economic value of the treatment because more wood volume is generated. Larger trees are being cut. Crown thinning should be applied only in wind-firm stands and where undesirable crop trees are present in the dominant and co-dominant crown classes. Combination thinning is another practice used in Nova Scotia. Because of variable site and stocking characteristics of many Nova Scotia woodlots, combination thinning is commonly used. It can include a combination of crown, low, or high thinning.